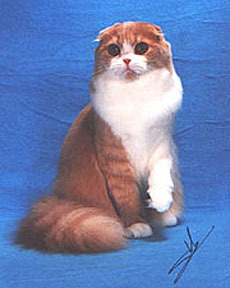 Arabel is a long-hair cream mackerel tabby and white girl. She is extremely friendly, and will ask for loving every chance she can. She get along with all the other cats, and loves to play. She has no fear of strangers -- they're just somebody else to play with! Arabel attended her first CCA kitten show on July 7 & 8, and came home with 8 rosettes, including 2 first-place rosettes in the kitten class. She loves the shows and all the attention she gets, even purring while being judged. Arabel became a CFA Grand Champion in Butler, PA on November 3-4, 2001. Arabel now lives with Dominique near Bordeaux, France. She made the long trip just fine, and now is settling in to her new surroundings, with her new housemates. Arabel will be attending shows in France, so she'll have to learn a new language. We've been told that she can already purr in French! Check out the website where she lives.